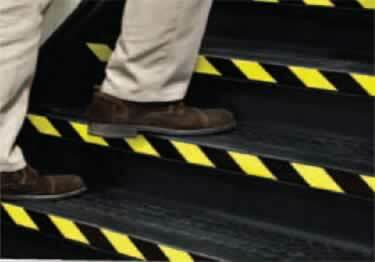 Our most popular conformable PVC laminated hazard warning tapes. These tapes will quickly bring attention to any workplace hazard. All tapes offer excellent durability and chemical resistance. 8-MIL premium laminated version for longer life. Hazard Warning Tape will adhere to most any clean, dry surface. Tape has a smooth semi-matte or laminated gloss surface. Great product for use on floors, walls, pipes and equipment. Floor marking Tape safety Black/Yellow hazard warning tape will quickly bring attention to any potential workplace danger. Highly visible and sticks well! This product is user friendly! Great product very durable used to designate an area to be kept clear, great adhesion and a good value free shipping was a plus! Easy to use and Cost Efficient! Great product, easy to apply and cut. Very cost effective way to mark your floors, walls, etc. Thank you Koffler Sales! The price of this tape was excellent and it arrived very quickly. It has bright color and was easy to apply. I applied it to a bare concrete floor that was poured about 3 months ago. I vacuumed the floor thoroughly before applying the tape but after 2 weeks the tape is starting to peel up at the edges. I'm not sure if there is still moisture escaping the new concrete and that is causing the peeling or not. If it gets no worse than it is now I'll still be happy. I bought the 2" wide tape.